From what planet does Theo Bleckmann come, and what century? His music is both otherworldly and timeless—not in a never-gets-old way, but in a Time Lord/Highlander way of someone who moves from era to era easily, casually, like the rest of us cross the street. In solo performance Friday night in St. Paul, part of Macalester College’s annual New Music series, the singer/composer took us back to the French courts of the 14th century and forward to a day in the future when a song like his surrealistic version of “I Remember You”—with a small talking bear squeaking “I love you! Kiss me!”—might conceivably top the pop charts. I’ve read about Bleckmann, watched some YouTube videos, listened to him online (and friended him on Facebook), but nothing compares to seeing and hearing him make music on the spot. (I went with a friend who’d seen him three times before, and he said this night was completely different than the others.) There were moments of haunting, heart-rending beauty, Bleckmann’s pure, clear voice looped, layered, and soaring. (That the performance took place at Macalester-Plymouth Church upped the ethereal factor.) The music was inspiring and disturbing, serious and funny, provocative, strange, and utterly absorbing. He began by striking a small turning fork, raised it briefly to his ear, then broke into what sounded at first like a yodel, a wordless vocalization that dipped into ohs and mms and clicks in the back of his throat. His inhalations were notes. Repeated patterns and rhythms formed a structure, a solid footing for the mind; this wasn’t just noise. “Duet for One,” an original composition. For “Douce Dame Jolie” by Guillaume de Machaut (c. 1300–1377), Bleckmann quickly laid down track after track of his voice, his own rhythmic breathing, and a light, high whistle, creating a thick carpet of rhythmic, repeated sounds over which he sang the lyrics (in French, if memory serves). Medieval and modern. His voice is a remarkable instrument, rubbery, rich, and precise, with a gorgeous vibrato, a range that seems limitless (from bass to choirboy high), and no problem with intervals of any size. He introduced “Dayo” (not the Harry Belafonte song) as his attempt “to create three sounds at the same time without any electronic help.” Breath and whistle, rhythm and hum. For a time, he put what looked like a trumpet mute in front of his face. “Channel Surfing/anteroom” was more layers, rising up into the church’s high ceiling, dreamy and transporting in this resonant space. “Free4all” began with a brief explanation: “The last one went up; now I’m coming back down.” It included fierce scatting and an unnerving section in which he appeared to be singing—screaming, pleading—but made no sound. 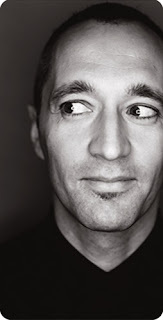 “Lilli Marleen” was the only song Bleckmann sang in German, his native language; he was born there in 1966 and moved to New York at 23 after meeting jazz vocalist Sheila Jordan at a workshop in Graz, Austria. For this, he used prerecorded vocal tracks which he embellished with more. The words floated above, around, and through the layers. One mystery of his live performance (there are many): How does he keep such a firm hold on a song, its words and especially its melody, with so many other sounds happening simultaneously? It must be like standing in the middle of NYC traffic and singing. He introduced “Lilli Marleen” by saying, “Thank you for coming out tonight to the Church of Crazy.” But it wasn’t crazy. Or maybe I’m crazy. I didn’t want it to end. This was real music, performed with feeling, commitment, and passion. It’s what I hope for when I go out to see an artist new to me: to be touched, surprised, shaken, and changed. One more thing: As weird as this performance might have seemed to some people in the audience (I saw a lot of quizzical looks being exchanged), no one left before the end. Fantastic review and it really makes me wish I had been there - I think he's a fascinating performer but have yet to have the opportunity to see him in the flesh - your review just frustrated me more! !